Michael D. Giardina (PhD, U. of Illinois) is an Associate Professor of Media, Politics, & Physical Culture in the Department of Sport Management at Florida State University. 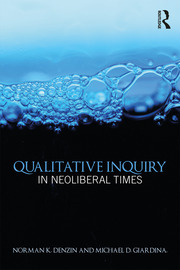 He has published widely on qualitative research methods, post-qualitative inquiry, physical cultural studies, biopolitics, and globalization/transnationalism. He is the current editor of the Sociology of Sport Journal. Michael D. Giardina (PhD, U. of Illinois ) is an Associate Professor of Media, Politics, and Physical Culture at Florida State University. He is the author or editor of 19 books, including Sport, Spectacle, and NASCAR Nation: Consumption and the Cultural Politics of Neoliberalism (PalgraveMacmillan, 2011, with Joshua Newman), which received the 2012 Outstanding Book Award from NASSS, Sporting Pedagogies: Performing Culture & Identity in the Global Arena (Peter Lang, 2005), which received the 2006 Outstanding Book Award from NASSS, and Qualitative Inquiry in Neoliberal Times (with Norman K. Denzin; Routledge, 2017). He is Editor of the Sociology of Sport Journal, Special Issues Editor of Cultural Studies⇔Critical Methodologies, co-editor (with Brett Smith) of the Qualitative Research in Sport & Physical Activity book series for Routledge, co-editor (with Norman Denzin) of the ICQI book series for Routledge, and Associate Director of the International Congress of Qualitative Inquiry.